Ever felt that Stephen King’s “Misery” was lacking in aliens? Director Jang Joon-hwan thought so too. So, he devised the 2003 genre-bending film “Save the Green Planet!” inspired by the aforementioned psychological thriller as well as the exciting internet theory that Leonardo DiCaprio is an alien. The resulting film contains elements of horror, comedy, science fiction and thrillers, and has gained a cult fanbase following its success at several international film festivals. This April, “Save the Green Planet” made its official debut as a stage drama at the Daehakro Arts Theater in Seoul’s most famous theater district, Daehangno. 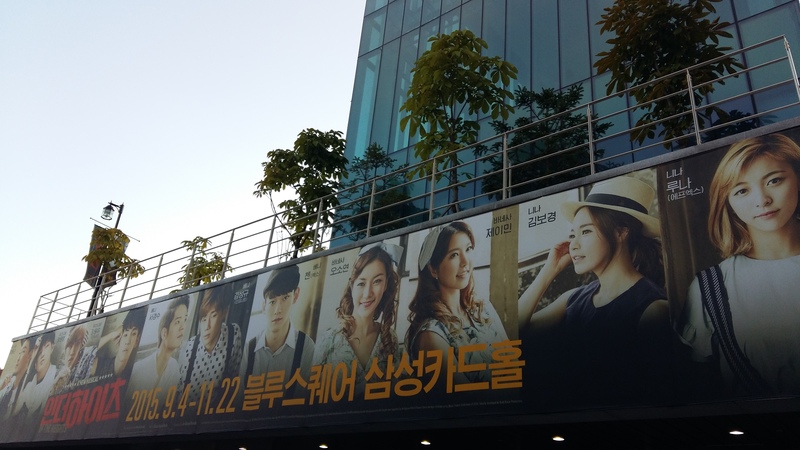 The script was adapted for the stage by playwright Jo Yong-shin and directed by Lee Ji-na. The story centers on Lee Byeong-gu, who believes only he can keep aliens from destroying the Earth. In order to get in touch with the Prince of Andromeda, Byeong-gu kidnaps the man he perceives to be the highest-ranking incognito alien in Seoul: pharmaceutical executive Kang Man-shik. Once he has Man-shik secured in his basement dungeon, the torture begins to get the answers he’s looking for before local detectives can find him. It’s a very good movie: a beautiful combination of goofy, disturbing and titillating. Definitely one to check out for fans of black comedy and zany sci-fi. The stage adaptation is quite a bit different — everything about the production is scaled down, which is intriguing. The set is very, very minimal and relies heavily on lighting, video projection and sound to create the scenes. The theater itself is small, holding only 500 seats with little space between the audience and stage. And the cast is comprised of only four actors. Shin Ha-kyun and Baek Yoon-sik star as Byeong-gu and Man-shik in the 2003 film “Save the Green Planet!” Photo courtesy of CJ Entertainment and Koch-Lorber Films. Like the film, the play is character-driven, relying on the actors’ performances to sell the story. As is customary, “Save the Green Planet” features a rotating cast for its characters. The show I attended featured SHINee’s Key as Byeong-gu, Kim Do-bin as Man-shik, Ham Yeon-ji as Byeong-gu’s henchman/girlfriend Su-ni, and Yuk Hyun-wook as literally everyone else. Hyun-wook is excellent onstage, and I was super impressed with his ability to make each of his many characters seem different in such a short period of time. He keeps the play’s momentum going and even interacts with the audience and improvises well. Key and Do-bin have great chemistry during the torture sequences, and all of the actors had good comedic timing. I was often amused by the perfectly choreographed, slow-motion fight sequences and chunks of dialogue delivered in the language of Andromeda. The play really excels in its comedy, and it is super entertaining. The best thing about “Save the Green Planet” is its ability to garner so many laughs despite the gruesome and weird plot progression. However, the play was not as successful as the movie at achieving the truly dark, twisted and emotional side of the story. I was very curious to see Key take on the role of Byeong-gu because he’s such a cute boybander, and he’s so different from the older, grittier actors who also star as Byeong-gu (as well as the film’s excellent Shin Ha-kyun). I would have loved to see him go all out into the addled mind of the character, but I get that he’s a pop star, he’s got other stuff to do, and he can’t fully dedicate himself to such method acting. But if they ever want to film a remake, I’m still curious. Overall, I really enjoy both the “Save the Green Planet!” film and play, and I would definitely see the stage production again. I appreciate how the actors work with the set-up onstage, as well as the source material. Ultimately, it’s a cool story about humanity. Now who will save the Earth? For more information, visit www.koreapac.kr. This entry was posted in Film, film review, Korea, Seoul, Theater and tagged aliens, Andromeda, Arts Council Korea, Baek Yoon-sik, black comedy, comedy, Daehakro Arts Theater, Daehangno, 대학로, 김도빈, film, film review, foreign films, Ham Yeon-ji, horror, horror movies, 키, 아트원씨어터, 함연지, 연극, 연극 공연, 육현욱, 이지나, 조용신, 지구를 지켜라!, Jang Joon-hwan, Jo Yong-shin, key, Kim Do-bin, Kim Ki-bum, Lee Ji-na, Leonardo DiCaprio, Misery, psychological thriller, Save the Green Planet, sci-fi, science fiction, seoul, set design, Shin Ha-kyun, shinee, Stephen King, theater, theater review, thriller, Yuk Hyun-wook on April 19, 2016 by screamfmlondon. “In the Heights” is a much-acclaimed musical centered on a Dominican-American neighborhood in Washington Heights in New York City. So you might’ve guessed why it’s slightly weird to see this musical put on in Seoul in the Samsung Card Hall at Blue Square. Seoul’s “In the Heights” production is highly entertaining, of course. The cast even impressively weaves Spanish and English (as well as hip-hop and salsa dancing) into the all-Korean script. The show is executed flawlessly: the singing is superb, the acting is charming and the dancing is lively. All it is lacking is the emotional connection, because so much of the story is deeply connected to the characters’ ethnic backgrounds. The original Broadway production of “In the Heights” was written by Lin-Manuel Miranda, who won several Tony Awards for his music, lyrics and acting and is currently performing on Broadway as Alexander Hamilton in the hip-hop musical “Hamilton” for which he also wrote the music and lyrics. “In the Heights” centers on Usnavi, a character born in the Dominican Republic and named after a US Navy ship (one of the first things his parents saw in America). With his comic relief sidekick, Sonny, Usnavi runs a bodega that is frequented by the neighborhood residents. These include: Benny, the aspiring businessman who works as a dispatcher at the cab company and is the play’s only non-Latino character; Nina, who has returned home for the summer to reveal to her parents that she dropped out of Stanford University; and Vanessa, a hairstylist who dreams of getting an apartment of her own and moving away from the Barrio. 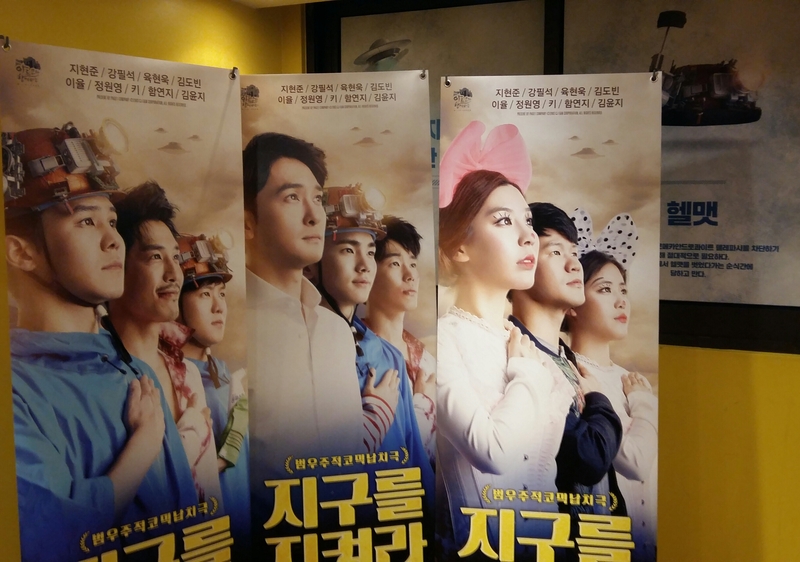 The Seoul production features a rotating group of k-pop stars and actors in the lead roles. The performance I attended saw Infinite’s Jang Dong-woo and Kim Sung-kyu as Usnavi and Benny, Oh So-yeon as Vanessa and Kim Bo-kyung as Nina. The cast’s talent and passion is unquestionable. The best moments are the musical’s large, ensemble numbers that fully utilize the backup dancers — “Carnaval del Barrio,” “Blackout” and “96,000,” during which the entire neighborhood comes out to fantasize about winning $96,000 in the lottery. The main cast was, overall, very impressive. So-yeon and Bo-kyung both demonstrated powerful vocals (although Vanessa is an infinitely more interesting character than Nina, who is kind of a drag). Dongwoo and Sungkyu were incredibly charming in their roles. Dongwoo had great comedic timing and command of the stage, and Sungkyu developed excellent chemistry with his co-stars and was very likeable throughout. It was a pleasure to watch them explore the personalities of their characters. However, this was the first time in my life I’ve ever seen fans rush the stage at the end of a musical theater production, like we were about to open up the mosh pit. I was all but clutching my pearls. It was worth it, though. “In the Heights” is a good show, and although it makes less sense overseas than it would in the US, the Seoul cast and crew have done nice work with the material. I hope we’ll get to see “Hamilton” next! For more information, visit www.interpark.com. This entry was posted in Korea, live music, Music, music review, Seoul, Theater and tagged 96000, Alexander Hamilton, backup dancer, Blackout, Blue Square, Broadway, Carnaval del Barrio, dance, Dominican Republic, Dominican-American, Hamilton, hip-hop, In the Heights, infinite, itaewon, jang dongwoo, Kim Bo-kyung, Kim Sung-kyu, Latino, Lin-Manuel Miranda, live music, music, musical, musical theater, New York City, Oh So-yeon, salsa, Samsung Card Hall, seoul, spanish, Stanford University, theater, theater review, Tony Award, Washington Heights on October 26, 2015 by screamfmlondon. 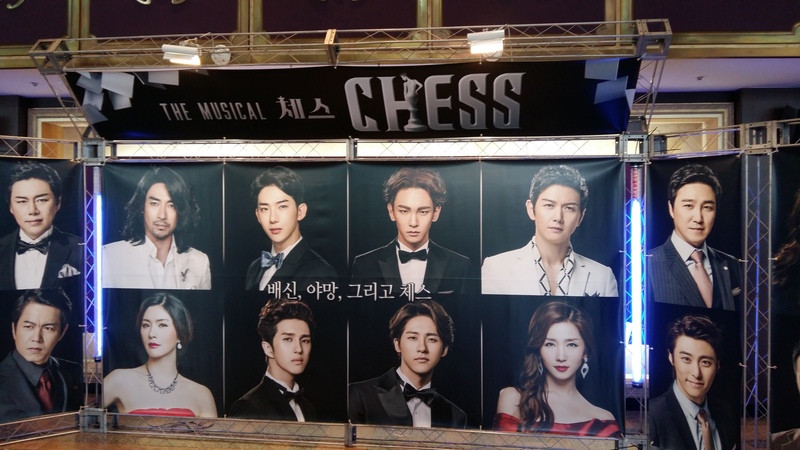 This June and July, the Sejong Center for the Performing Arts hosts the musical “Chess,” marking its debut in Asia. The musical was composed in the early 1980s by two former members of ABBA. The story follows a Cold War-era chess tournament between the American grandmaster, Freddie, and the Soviet grandmaster, Anatoly. The two men conflict not only over chess but also over their mutual attraction to Freddie’s manager, Florence. It’s a story of betrayal, ambition and… chess. I feel like there was a rather weird phase of pop culture interest in chess during the 1980s and ‘90s, traceable back to the brief fame of Bobby Fischer. I definitely studied a disproportionate amount about chess while I was in school (compared to how useful it’s been in life, which is not at all). During my lifetime, I have seen exactly zero evidence that the paparazzi and/or the general public would ever care about chess championships, but it comes up all the time in literature. Unfortunately, chess is not actually that exciting as a subject for musical theater. The Seoul production was basically carried by the ensemble dancers and the spectacular choreography from Seo Byung-goo and Hong Yoo-sun. The cast made interesting use of the stage, set and props to keep each scene at its most visually stimulating. And “One Night in Bangkok” is a total jam. But there’s only so much dancing rooks can do for your show, y’know? The main cast rotates throughout the week and includes a number of well-known k-pop stars. The performance I attended featured Ken from the band VIXX as Anatoly, Shin Sung-woo as Freddie, and An Si-ha as Florence. Ken has a powerful voice, which was particularly evident during his cynical solo song “Where I Want to Be.” This number was definitely one of the highlights of the show and showed off his smooth vocals. However, Ken’s acting did not seem on par with his singing — he struggled to come across mature enough to accurately portray Anatoly. His musical talent is certain, but his acting failed to bring any emotional depth to the character. He also failed to create any real chemistry with the other actors; certainly not with Florence, for whom he was supposed to feel some heart-wrenching passion. I’d be curious to see the performance again with a change in cast to see how the different actors would alter the experience, or if “Chess” is just unsalvageable. I dunno. Let’s call it a stalemate. 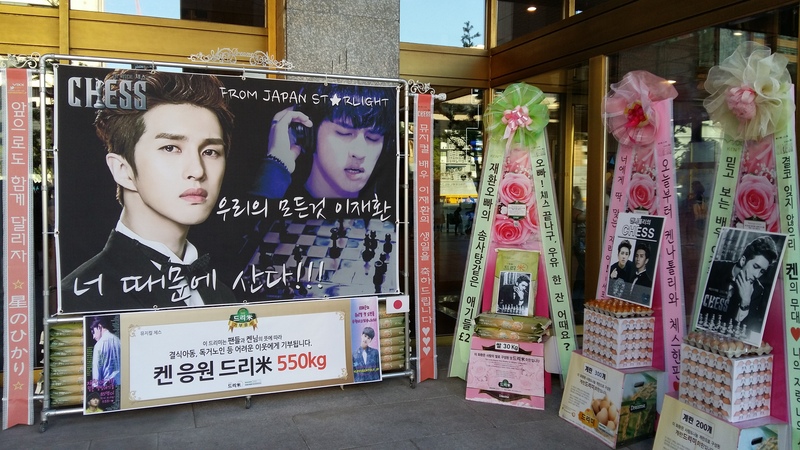 For more information, visit www.musicalchess.co.kr. This entry was posted in Korea, live music, Music, Seoul, Theater and tagged ABBA, An Si-ha, asia, Bobby Fischer, chess, choreography, cold war, dance, Hong Yoo-sun, k-pop, ken, korea, live music, music, musical, musical theater, One Night in Bangkok, Sejong Center, Sejong Center for the Performing Arts, Seo Byung-goo, seoul, Shin Sung-woo, theater, theater review, vixx, Where I Want to Be on June 29, 2015 by screamfmlondon. Edward Sharpe and the Magnetic Zeros plays from a stereo in the background as audience members take their seats upstairs at the Pieter Performance Art Space for the UnMasqued theater company’s second week of “Much Ado About Nothing” performances. It was the most interesting reinterpretation of “Much Ado About Nothing” I’ve ever seen. In the UnMasqued production, the characters join together to form The Arragons, a touring band of bluegrass/folk musicians, who are returning to their favorite venue, The Messina, to perform songs they have written about their adventures for an upcoming album called “Much Ado About Nothing.” It’s really amazing how well this concept works and how seamlessly the original music is woven into Shakespeare’s text. The story — with all its mischief, romantic entanglements and comedy — lends itself remarkably well to a cast of cool, young modern-day musicians. The production begins with an impressive, rousing opening number featuring several of the multi-talented actors that comprise the cast on a range of instruments, including the accordion, fiddle and harmonica. It is understood that this is a homecoming concert after the band has been away on a year-long tour. “That’s when I first met Hero,” Claudio (Dillon Horner) says of the last time the band appeared at The Messina when the song is finished. 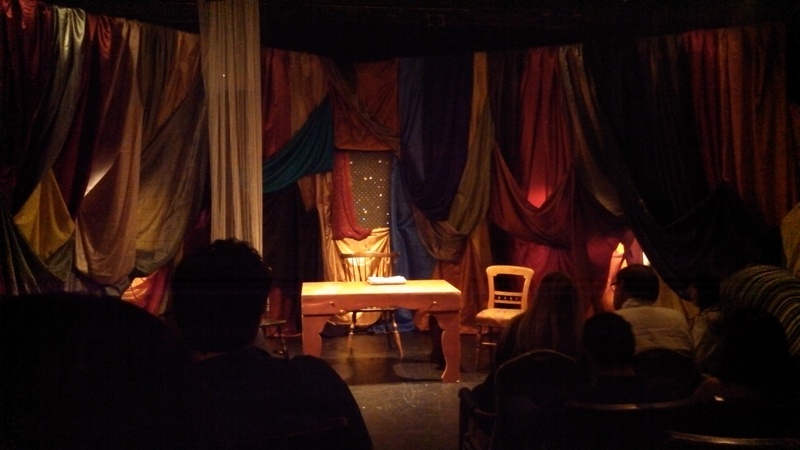 Then, the backdrop of colored handkerchiefs is moved aside, and the play begins. The production is extremely well-executed, and elements of the unique bluegrassy theme are consistently evident in every scene. Ty Fanning and Torey Byrne are especially entertaining as Benedick and Beatrice. They have great back-and-forth chemistry and are hilariously expressive as the characters evolve from hating each other to being tricked into realizing that they love each other. Kristyn Chalker gives another standout performance as Don Pedro, the Prince of Aragon. She has a strong, commanding stage presence, and the gender-reversal of this role adds an additionally compelling element to the character’s story — most notably when it comes to her relationship with her troublemaking brother Don John (Josh Henry). 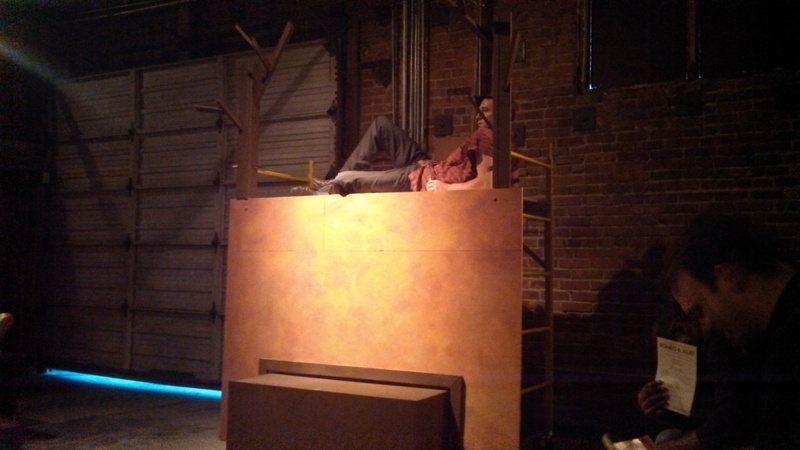 It becomes clear that UnMasqued’s “Much Ado About Nothing” is not just a play and not just a concert. It becomes a much more immersive experience as cast members climb through the audience, pulling people up to join in on the dancing and, at one point, to take notes on a chalkboard during an interrogation of Borachio (Parker Wilmoth) by the night watchmen, who include the exceptionally amusing Dogberry (Harriet Fisher) — the real star of the second act. Altogether, I was quite blown away by the quality of this production. Though the company is so new, “Much Ado About Nothing” is incredibly fun and outstandingly well-produced. I left the theater tapping my toes, feeling strangely excited about Shakespeare. It’s a good feeling. 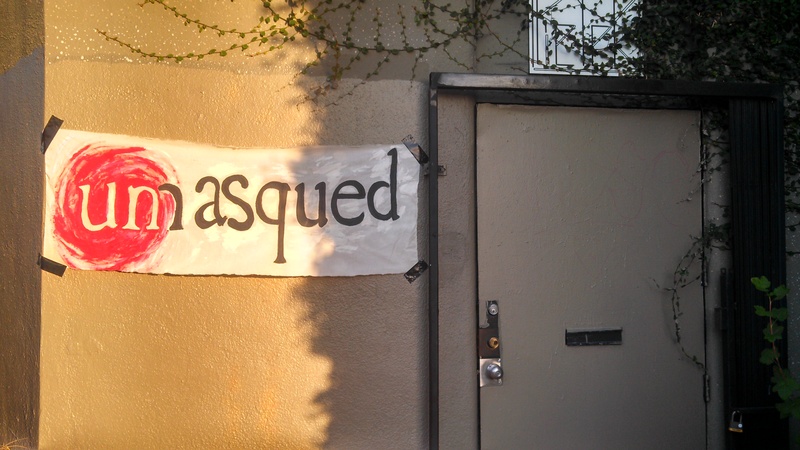 For more information, visit www.unmasqued.org. This entry was posted in Literature, live music, Los Angeles, Music, Theater and tagged bluegrass, comedy, Daniel Ryan Wallach, Dillon Horner, Edward Sharpe and the Magnetic Zeros, folk, Harriet Fisher, Josh Henry, Kristyn Chalker, lincoln heights, live music, los angeles, much ado about nothing, music, Neil Fleischer, Parker Wilmoth, Pieter Performance Art Space, romantic comedy, shakespeare, theater, theater review, Torey Byrne, Ty Fanning, UnMasqued, william shakespeare on July 29, 2014 by screamfmlondon. It was a hot summer night in Santa Monica, and the audience was pressed closely together on rows of wooden benches lining the either side of the stage — pressed even tighter when Romeo scooted us over in his efforts to hide from Mercutio and Benvolio at the Capulets’ ball. Last week, the City Shakespeare Company concluded its latest run of “Romeo & Juliet” with a semi-modern interpretation of the classic story. “Romeo & Juliet” is always, at first, the ultimate tale of rebellious teenage love against all odds. Until you get older and begin to recognize it as a valid example of why 13-year-olds should not be making important life decisions. The CityShakes interpretation did an impressive job illustrating both perspectives of the story. David Hartstone and Megan Ruble are expressive and passionate as Romeo and Juliet; both actors had moments onstage where their true innocence (and irrationality, really) shone through. Likewise, the supporting cast (Gilbert Martinez as Father Laurence and Mallory Wedding as the Nurse in particular) represented the outsider’s “adult” perspective on the romance that ends in tragedy. Wedding as the Nurse was perhaps the most entertaining part of the play. Her interpretation was unique and gave unusual life to a character I would have otherwise considered unremarkable. Wedding’s stylistic choices were really amusing as the Nurse toed the line between wise and ridiculous, serving as a big sister-like figure to Juliet and a solid contrast to Juliet’s youthfulness and naiveté. Wedding would make a great Polonius — just sayin’. Although the playbill states that CityShakes’ “Romeo & Juliet” takes place “now” in “Anytown, USA,” there was only a little bit of evidence to support this. The biggest anachronism was Paris (Daniel Landberg), Juliet’s would-be betrothed, who still carried around a large sword strapped to his waist. As Paris is clearly the most oblivious character in the play, this only further emphasized how out-of-touch he is from his surroundings. So, it worked, whether or not it was actually intentional. Immediately following the performance, the cast and crew held a Q&A segment for the benefit of the high school students in the audience, which was a nice touch. CityShakes performances are especially great for students, parents and teachers because they are more traditional adaptations with minimal sets and costumes, but the actors express clear respect for the original text, which makes the performances clear and accessible. The size of the theater (such that I probably could have reached out and touched Romeo during his dramatic final scene in the crypt) as well as the size of the cast (only seven actors, most of whom played two or more roles) make the experience feel all the more like community outreach. 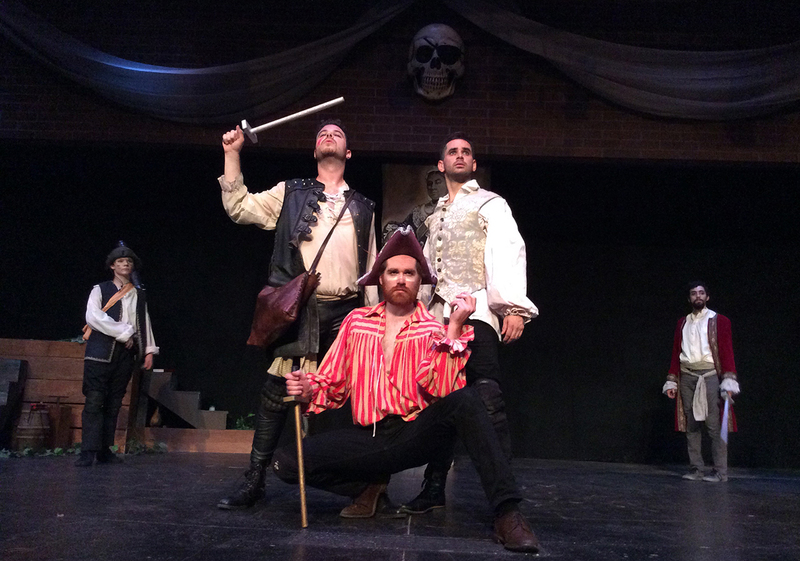 And the City Shakespeare Company really is a great asset to the community — it continues to offer simple, relatable and charming adaptations of Shakespeare’s classics. I already look forward to the next one. This entry was posted in Literature, Los Angeles, Theater and tagged City Shakespeare Company, cityshakes, colin martin, daniel landberg, david hartstone, gilbert martinez, los angeles, mallory wedding, megan ruble, romance, romeo & juliet, santa monica, shakespeare, theater, theater review, tragedy, william shakespeare on July 28, 2014 by screamfmlondon. Against a multicolored backdrop of glittery silk fabrics, Nadia Manzoor magically transformed herself into 21 diverse characters for three sold-out performances of her one-woman show, “Burq Off!” July 17-19 at Elephant Stages in Hollywood. The 90-minute show follows Manzoor’s life, beginning when she was five years old and wanted to become an astronaut but was rebuffed by her father (“Who will feed your husband if you are floating about in space?”). It culminates during her university years with a poignant scene in which Manzoor’s twin brother Khurram, who has become an Islamic extremist, tells her that her straying from the Muslim lifestyle is the reason their mother died of cancer. The story aims to inspire self-exploration and self-expression through Manzoor’s own experiences trying to define and make peace with her identity as a woman and as a Pakistani Muslim living in London. Manzoor, who wrote and stars in the play, does a remarkable job of embodying all of the characters in her life using only her voice, her body and a few transformative pieces of fabric. It’s really not a one-woman show at all; it’s as rich as if there were a dozen different actors on the stage. It’s impressive to see everyone, from her ultra-stern Abbu (dad) to her white classmates at an all-girls school in England and the Irish bartender she falls in love with while attending Manchester University, come to life despite the minimal presentation. The performance was, at times, mildly amusing, although not quite as laugh-out-loud hilarious as some of the more gregarious audience members seemed to find it. One of the most notable touches of “Burq Off!” was a parallel set of dance sequences during two pivotal moments in Manzoor’s life: the first time she wore a burqa in public and, later, the first time she stepped out in a bikini. Each garment was equally liberating for her in its own way — a freedom that could only be expressed through song and dance. Manzoor, who is also (apparently) a dancer, cleverly incorporated elements of Bollywood and hip-hop styles and combined them with her own comical delivery for very memorable musical asides. The Elephant Stages theater excelled at designing a powerful and versatile set for Manzoor to work within and manipulate while telling her story. Just one table and a few chairs whisked the audience away to the dorm room in which Manzoor lost her virginity, the bar counter she vomited upon after getting drunk for the first time, the hospital bed where she last spoke to her Ammi (mom). “Burq Off!” was a well put-together coming-of-age story and an honest examination of the advantages and disadvantages of growing up in a conservative Muslim home. It’s not a perspective that is heard often enough in the United States, and Manzoor’s strong talent makes her an all the more effective storyteller. This entry was posted in Los Angeles, Theater and tagged bollywood, burq off!, burqa, coming-of-age, dance, elephant stages, england, hip-hop, hollywood, islam, london, los angeles, manchester university, muslim, nadia manzoor, pakistan, set design, theater, theater review, urdu on July 21, 2014 by screamfmlondon.